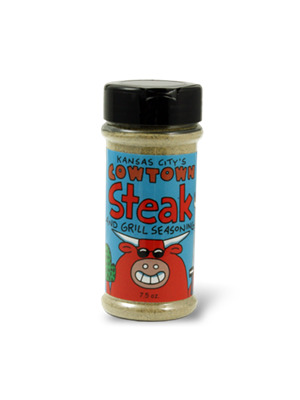 Cowtown Steak and Grilling Seasoning is an awesome blend of spices that is perfect on your favorite cut of steak. But don't stop there: try this wonderful blend on burgers, veggies or even a dash in your bloody Mary! 7.5oz. Salt, spices, garlic powder, corn starch, maltodextrin, disodium inosinate and disodium guanylate, hydrolyzed soy protein, sugar, beef fat, beef broth, onion powder, silicon dioxide (ant-caking), yeast extract, caramel color, natural flavor.